What if we just went ahead and did it? That was the beginning of the problem Jake and Katie now faced. They found an enchanting old wooden sailboat, it looked to be in immaculate condition. On their maiden sail around Vancouver Island, they lost the island. Waking one morning to the smell of ash and char on the open ocean, they are scrambling to figure out what happened when they rescue a cat who is the key to the revolution, and now they’re on the run from mages, pirates, and of course everyone else. It’s mine, all mine, but you can read it while I write it, if you want…. 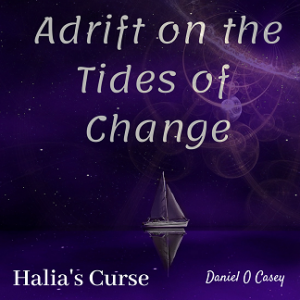 This is the holding page for the story which is tentatively titled Halia’s Curse, and used to be called Adrift, way back when I started it without knowing what it was all about. This is the draft. I’ve scanned it for spelling and gross typing errors, but there are going to be plot holes, errors, omissions, and changes along the way. I am not going to go back and fix them here. When the book is ready to edit and rework, format and publish, I’ll pull these pages and move the main linking over to the ‘press’ page. Thus, a book blurb, my first ever, so bear with me. This is the holding page for the chapters of the story. Those chapters can be accessed from the drop menu above, or linked through as I set them up. Here’s the link to Chapter 1. Enjoy, let me know what you think. Duke.